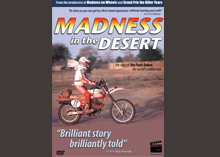 Madness in the Desert - a new motorsport documentary from Bigger Picture, makers of the acclaimed Grand Prix: The Killer Years and Deadliest Crash. for just £4.99 plus p&p! Contains exclusive full un-cut interview with Mark Thatcher and his driver explaining what really happened when they got lost in 1982. In 1977 French motorcyclist Thierry Sabine was in serious trouble, lost in the Libyan Desert and dying from thirst. Whilst most men would weep and think back over their lives, Thierry thought about coming back - to do a rally across the Sahara Desert. 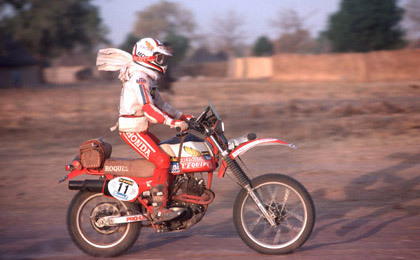 The 9000km Paris-Dakar, the world's craziest race, was born. 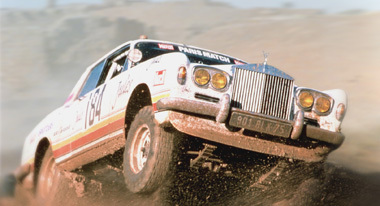 The rally became a beacon for eccentric adventurers battling the terrain in customised vehicles, seduced by the romance of the desert and the extreme challenge. It soon became a victim of its own rapid success, shrouded in controversy, overwhelmed by corporate interests, responsible for over 60 deaths and decreed vulgar by the Vatican. Finally, in 2008, this incredible event was brought to an end by terrorism. Featuring winners Cyril Neveu, Hubert Auriol, Jean Louis Schlesser, Ari Vatanen, Stephane Peterhansel, Martine De Cortanze and many many more. This is the story of the biggest motorsport event the world has ever seen and one of the greatest challenges of human endeavour ever conceived, from those that took part. How the West took on a landscape of incredible beauty and scale. And lost.